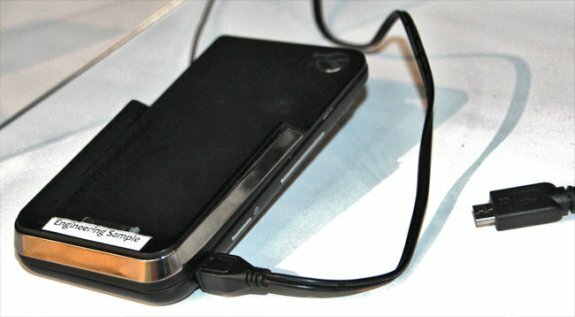 KitGuru reports Taiwanese firm AIPTEK is working on a personal projector for the iPhone. Current prototypes are equipped with a 15 Lumen light source but at Computex the firm aims to introduce a compact iPhone projector with a 50 Lumen light source. Pricing is said to be less than 200EUR. How much is 1 Lumen and why would you need more? Well, at the most simple level, if you had one standard candle’s worth of light, then it is rated as 1 Candela – which means it is pushing out 12 Lumens in a sphere. So the ‘light of a single candle, in a single direction, as seen by the human eye – is a Candela but its radial luminosity in all directions is rated in Lumens. With a quick calculation, you can see that 1 Candela at source is 12.57 Lumens in all directions [Note that we have deliberately used caps to make these sciency words stand out - don't try that at home - Ed]. So AIPTEK has moved from one candle to almost 4 candles with its new design. In the same space. Monks would be proud! AIPTEK claim that it will be ready for mass market launch at less than €200 by Computex in June. We’ll see. In the meantime, here are some cool pics of the unit being used. Without an obvious audio solution, it’s easier to see these being used in a business, rather than home entertainment situation. Also, no word on whether there will be an iPad version.